Early summer strawberries are upon us in Southern Ontario and a local supermarket had local strawberries on sale so I bought a goodly amount and everyone has been eating them for breakfast. I really wanted to have strawberry shortcake for dessert a few nights but wanted to make my own sponge cake. On Saturday I was at the library with the family and while perusing the latest issue of Fine Cooking found they featured a hot milk sponge cake recipe: it’s also available on their website. I decided to try the recipe but wanted single serving sizes, but the only vessel I had that could possibly fit the bill were muffin pans. After making them I found the cakes a little small and served two per person. I greased the inside of the muffin tins with butter, and this seems to have caramelized the exteriors but allowed for easy removal once a knife was slipped around each cake. I baked for 25 minutes but should have removed them sooner. Whisk the flour and baking powder in a medium bowl. Grease your muffin pans with butter or cooking spray. With an electric mixer (hand-held or a stand mixer fitted with the whisk attachment), beat the eggs, yolks, sugar, vanilla, and salt at high speed until the mixture has tripled in volume and forms a slowly dissolving ribbon when the stopped beater(s) are lifted, 4 to 6 minutes. Meanwhile, heat the milk and butter in a small saucepan over medium heat until very hot but not boiling. Using a fine-mesh sieve, sift one-third of the flour over the eggs. Fold with a large silicone spatula until the flour is blended into the batter. Repeat with two more batches. Pour all of the hot milk mixture over the batter and fold gently with the silicone spatula, scraping the batter up from the bottom of the bowl and rotating the bowl, until the milk is incorporated. Scrape the batter into the pan and spread evenly. 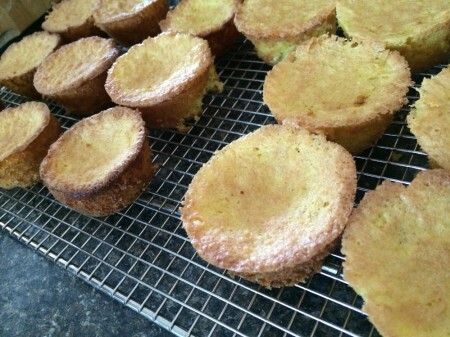 Bake until the cake is golden and a tester inserted into the center comes out clean, 15 to 20 minutes. Set the pan on a rack to cool. After the cake has cooled completely, run a small knife or offset spatula around the inside of the pan, pressing against the pan to avoid tearing the cake. Invert the pan to remove the cakes. Turn the cakes right side up.